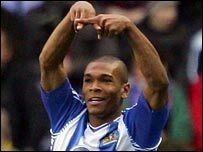 Marcus Bent scored a hat-trick to help Wigan beat Blackburn in an eight-goal thriller at the JJB Stadium. Strikes from Denny Landzaat and Bent, and a bullet header by Paul Scharner, saw the hosts open up a 3-0 lead. Benni McCarthy had a penalty saved but Roque Santa Cruz, with a half-volley, tap-in and header, grabbed a hat-trick to draw Blackburn level. They lost Brett Emerton to a red card before Bent completed the win with a close-range header and easy finish. 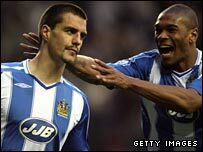 The result arrested a run of 13 games without a victory for the Latics and marked Steve Bruce's first win as manager. Blackburn remain ninth in the league but have now won only one of their last seven games, and boss Mark Hughes will be livid with his side's defensive display. Wigan had scored just five goals in their previous nine games but the visitors' back four were all at sea throughout. They could have been behind within three minutes when Ryan Taylor swung a superb cross in from the left which deceived Ryan Nelsen but hit Bent in the face with only Brad Friedel to beat. But that opportunity set the tone for the opening exchanges and Wigan piled on the pressure. Blackburn's returning captain Nelsen was terrorised by Bent throughout and after nine minutes the on-loan striker made a telling contribution. He controlled Titus Bramble's headed clearance with a truly sublime touch, which doubled as an assist, to send Landzaat racing clear of the Blackburn defence. The Dutchman finished low to Friedel's left with aplomb. Hughes's men were unusually disorganised and two minutes later Bent beat Nelsen to another header out of defence. The 29-year-old collected the ball himself, skipped round Stephen Warnock and drove his shot past Friedel. Blackburn worked hard to get themselves back into the match and were rewarded when referee Mark Clattenburg penalised Emile Heskey for bear-hugging Samba from a corner. McCarthy's abject spot-kick, albeit well saved by Chris Kirkland low to his right, epitomised Blackburn's first-half performance. That lifted Wigan again following a brief lull and they pressed home their advantage in the 36th minute. Christopher Samba's needless foul on Heskey as the England striker was ushering the ball out for a corner provided the home side with a free-kick just outside Blackburn's penalty area. Taylor rifled his free-kick across the face of goal and Scharner headed past Friedel from point blank range. That should have all but ended the Lancashire derby as a contest but Wigan endured a dreadful end to the half. On 39 minutes Heskey was carried off with what looked like a serious ankle injury, which meant several minutes of stoppage time were added on. That gave Blackburn time to pull a goal back - Santa Cruz controlling the ball on his chest before lashing a fierce half-volley past Kirkland with the last kick of the half. Blackburn started the second half full of confidence and it was no surprise that they reduced the deficit further. With Wigan still half-asleep a quick free-kick was worked to Emerton who sent over a cross. Steven Reid's header hit Emerson Boyce and Kirkland could only parry the ball out for Santa Cruz to tap in. Hughes and his players were left fuming when Clattenburg deemed Emerton to have fouled Taylor in the 57th minute. Although the challenge appeared innocuous, the Tyne and Wear official showed the Australian a second yellow card. But that failed to alter the run of play as Santa Cruz headed in Warnock's fine cross after a determined run by Bentley. It was the first time two hat-tricks had been scored in one match since Robert Pires and Jermaine Pennant inspired Arsenal to a 6-1 thrashing of Southamton in 2003. While Blackburn were pressing hard in a bid to take the lead, Wigan's one-man advantage began to tell. But poor defending from Warnock allowed Antonio Valencia to square for Bent to power home. Then, 10 minutes before the end, Bent wrapped up the points when he converted Julius Aghahowa's cross from the right. "We're in an fight and the first half, apart from the last 10 seconds, was a complete performance. "If they show that attitude and application and we get the rub of the green we'll give ourselves a chance. "It's a big, important victory for us. The next few weeks will be vital and we'll give ourselves every chance." "We were really poor in the first-half. Defensively we weren't at the races. "In the second-half we got to grips with the two lads up front for Wigan and our performance was remarkable. "When you score three goals away from home you expect to get something out of the game but it wasn't to be." Wigan: Kirkland, Taylor (Olembe 89), Boyce, Bramble, Kilbane, Valencia, Brown, Scharner, Landzaat, Bent, Heskey (Aghahowa 40), Aghahowa (Granqvist 90). Subs Not Used: Pollitt, Koumas. Booked: Heskey, Taylor, Aghahowa, Brown. Goals: Landzaat 10, Bent 12, Scharner 37, Bent 66, 81. Blackburn: Friedel, Emerton, Samba, Nelsen, Warnock, Bentley, Reid, Savage, Pedersen, McCarthy (Derbyshire 74), Santa Cruz (Dunn 90). Subs Not Used: Brown, Mokoena, Olsson. Booked: Samba, Emerton, Warnock, Savage. Goals: Santa Cruz 45, 50, 61.